IRVINE, CA - May 6, 2007: Volvo Car Corporation calls all pirates, rogues and scallywags to join The Hunt! It's time to stop speculating and start searching as Volvo launches its worldwide hunt for real-life sunken treasure, May 4 at volvocars.us/thehunt. 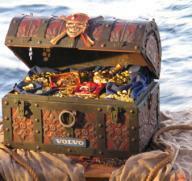 Volvo literally has gone overboard in the second year of its promotion of Disney's Pirates of the Caribbean movie franchise, and has sunk a chest filled with $50,000 worth of gold doubloons plus the key to a brand new Volvo XC90 to the ocean depths, "Somewhere in the World." Anyone hardy enough to try and find it can take part in the online treasure hunt, which starts simultaneously in 22 markets, May 4 and ends with a global online 'head to head' June 2. To join The Hunt, participants 18 and older must visit a Volvo retailer to pick up a special pirate chart then register at volvocars.us/thehunt any time between May 4 and May 29. Winners will only be eligible if they can produce the original pirate chart upon conclusion of The Hunt. Once registered online, hunters set sail on their virtual high seas adventure and move on, receiving clues, as they solve a series of challenging and fun online puzzles. People can join The Hunt at any time through May 29, and can catch up with other participants if they correctly answer the puzzles posted online. As the contest progresses, the puzzles will become increasingly harder to solve. On June 2, the first person from each of the 22 participating markets to finish the online hunt will compete against one another in one final exciting online challenge. The first of those 22 individuals to solve the final puzzle will be named the winner and will receive a trip to the burial location to retrieve the chest filled with $50,000 in pirate gold and a key to a new Volvo XC90. "Last summer, we held a treasure hunt to find a buried Volvo XC90 V8 to tie in with Disney's Pirates of the Caribbean: Dead Man's Chest and were blown away by the success -- more than 100,000 participants from around the world joined in," said Linda Gangeri, national advertising manager for Volvo Cars of North America. "This year, with more countries, more booty and all the early interest, we're really excited to 'set sail.' So, come join The Hunt!" In addition to the United States, Austria, Bulgaria, Canada, Germany, Hong Kong, Indonesia, Italy, Japan, South Korea, Malaysia, Mexico, Norway, Philippines, Poland, Romania, Russia, Singapore, Sweden, Taiwan, Thailand and the United Kingdom are participating in The Hunt. Disney's Pirates of the Caribbean: At World's End opens in U.S. theaters May 25. Participants in The Hunt are encouraged to visit http://thehunt07.spaces.live.comhref>, Volvo's treasure hunt blog and message board, to learn more and discuss the Hunt's developments.